In the midst of a difficult holiday season, Kristen Morrow was struck with inspiration. Last year, Morrow saw a news story on a neighborhood tradition in San Francisco called the “Wishing Tree.” Members of the community came together each year and decorated a tree, writing prayers, hopes and wishes and attaching them to the tree. Morrow shared the story on her Facebook page, where it caught the eye of former City Council member Heather Reid, who immediately began working with the city to gain permission to do a similar project in downtown Homewood. The project was such a hit with the community that it will be back again this year Dec. 26. You have until mid-January to pin your wishes to the tree, which is located on 18th Street in the downtown area of Homewood in front of Trak Shak. Tags and markers will be provided at the tree, but well-wishers are welcome to bring their own, as well. 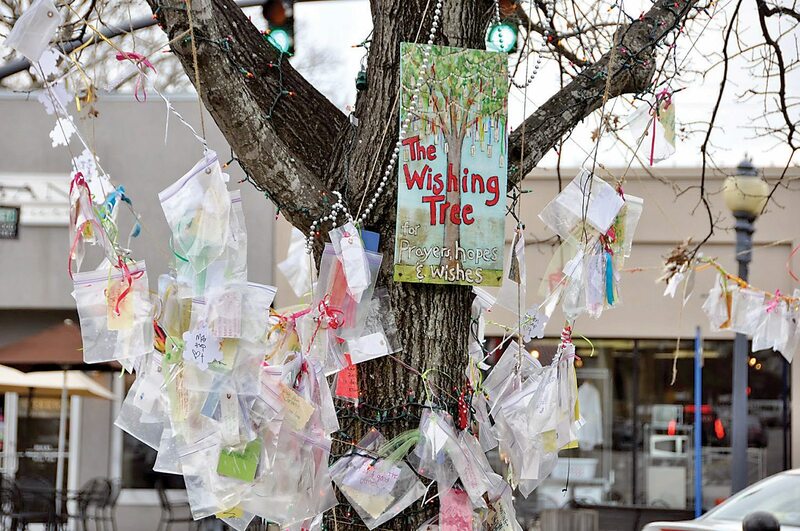 For more information on the Wishing Tree or to share your visit, visit the Homewood Wishing Tree Facebook page.